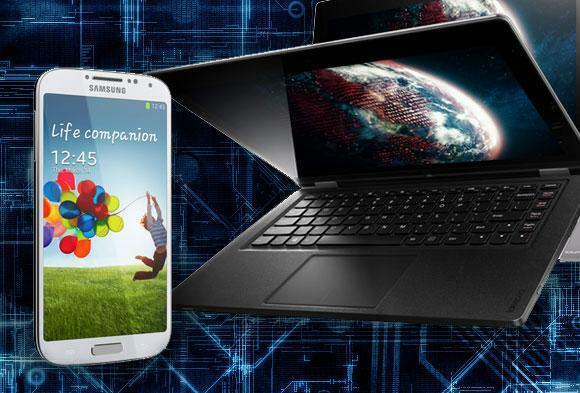 Are Smart Phones and Tablets Going to Replace Desktops and Laptops? Ever since Apple released the iPad on January 27th 2010 we have seen a huge shift in how we do our basic computer work. From social media to keeping in touch with your family through emails we have grown more and more attached to our phones than ever before, So it's no surprise the tablet has grown to be a huge part of what we do while we're relaxing at home or even on vacation. The tablet is just like our laptops but without all the bulk and have a much better battery life, for most people this meets 99% of their computing needs. So why wouldn't you just have a tablet and get rid of your laptop and desktop? Most people today have a smart phone, tablet and a home computer of some sort but admit they rarely use the computer versus their smart phone and tablet. So why are smart phones so far in the lead for the most used electronic device being made? It's simple every person has a cell phone and with how long they've been out they've become cheap enough that for just one dollar you can buy a new smart phone with email, internet, games and endless apps to download. With how fast and capable these new gadgets are why would anyone still want to spend over a thousand dollars on a computer? There is only a few things a computer is still better for and the main reason is typing. For school and business you can't replace a keyboard both in size and feel. The new tablets are offering keyboards but the first time you try to use one of these portable keyboards you'll see they're too compact and it's hard to tell what you're typing if anything at all! Tablets and smart phones also aren't nearly powerful enough to play modern games like a PC or game system can. Until they either stop making games so demanding (this won't happen) or until they can make processors powerful enough to fit into these smaller devices and be just as powerful there will still be people building gaming PCs and typing up their school and business reports on them. Now if you're the casual user or just want to sit on the couch and read, the tablet is the perfect electronic for you and there is multiple options like the Kindle, Nook and iPad that are all fighting for the best eBook reader. The common user will have a ton of choices from screen size to if they even need a tablet over their smart phone. Each one will have it's advantages but these will be the people who don't need their laptops and desktops anymore. For these people it will be important to properly sell or recycle that old laptop and help prevent America's growing E-waste problem. I think within the next 5-10 years we will see a major change in how home computing is done and there will be more of a split from the business and professional users to the basic users who just need the device for entertainment, Laptop sales are going lower and lower every year proving that tablets are taking a larger share of the market every year. Apple keeps releasing fast iPads of all different sizes so if you haven't looked into a tablet yet I'd recommend starting with Apple's iPad!